In a post-Avengers world, it's easy to peg this month's release of Rise of the Guardians as just another attempt to capitalize on the "superhero team-up" format that has made Marvel boatloads of money so far. There are similarities, for sure; the main characters here are legendary icons essentially imbued with superhero powers, they must overcome their differences to battle a common enemy, and they're each a larger-than-life character that could lead his or her own film. But this movie has enough heart and tender moments to put cynics' minds at ease, and with a dash of humor and an occasionally dark arc in its hero's journey, DreamWorks Animation's adaptation of William Joyce's book rose high above initial expectations. After the Shrek franchise lost its creative steam, DreamWorks Animation was floundering. Its films were still making money, but they were filled with instantly dated pop culture jokes and just weren't connecting with audiences in the way that their rival studio Pixar's movies were. In an effort to right the ship, DreamWorks brought Pan's Labyrinth director Guillermo del Toro into the fold to act as a creative consultant and executive producer, and the studio also hired famed cinematographer Roger Deakins as a visual consultant on its films. Since then, the results have been terrific: How to Train Your Dragon was one of the best movies of 2010, Kung Fu Panda 2 improved on the formula of the first, Puss in Boots was far better than expected, and even Megamind turned out to be a great reversal of superhero lore. Their streak remains unbroken with Rise of the Guardians, a fresh look at what happens to some of the world's most famous icons when evil looms its head. 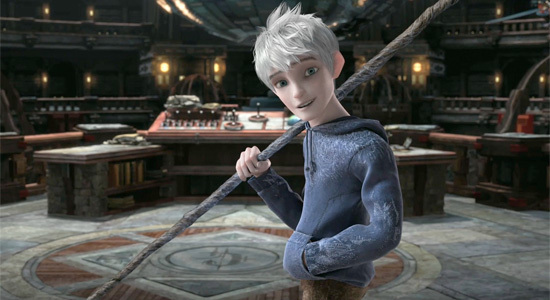 Jack Frost (Chris Pine) is 300 years old, but he still hasn't found his purpose in life. Being one of these mythological figures is sort of like participating a cosmic popularity contest, and since Jack isn't as well known as mainstays like Santa Claus, aka Mr. North (Alec Baldwin), the Tooth Fairy (Isla Fisher), the Easter Bunny (Hugh Jackman), or the Sandman (Tom Kenny) - collectively known as the Guardians - no one can see or interact with him. Jack keeps in decent spirits and causes a bit of mischief here and there, but like most heroes, he's ultimately on a quest for self-discovery. When Pitch Black, aka the Boogeyman (Jude Law), returns from years of dormancy to use fear to prey on the world's children, Jack is chosen as the newest member of the Guardians and must find out who he is and save the world before it's too late. The interactions among the Guardians are a lot of fun, as many of the characters have a competitive banter reminiscent of Legolas and Gimli in The Lord of the Rings, a friendly rivalry with one another about whose holiday is more important and whose powers are the most effective (highlighted in a great tooth retrieval sequence in the middle of the film). The cast embodies their characters in entertaining ways, with Hugh Jackman's Aussie accent playing into the Easter Bunny's tough guy persona and Isla Fisher's happy-go-lucky attitude matching well with the Type-A Tooth Fairy. Jude Law's smooth voice fits perfectly with the dastardly Pitch, a devilish figure who uses temptation, fear, and doubt as his weapons of choice and who can slip effortlessly from shadow to shadow. Chris Pine does a great job of balancing mischief with melancholy, and Alec Baldwin's excellent Cossack accent is perhaps the movie's biggest surprise. Though there is undoubtedly a current of darkness that runs throughout the film (the opening sequence is especially ballsy for a movie aimed at children), it's also sometimes very funny. Santa's elves, the requisite "cute" characters, thankfully aren't in the movie that much, so their annoying qualities barely register and they even earn the occasional chuckle. Sandman is a silent character, communicating by creating symbols out of sand that pop up like light bulbs over his head, and there are plenty of opportunities for physical comedy with him. Since the elves are terrible at their jobs, the film's best running gag goes to the Yetis, who Santa employs to secretly build toys in his workshop as to not hurt the elves' feelings. The Yetis are silent too, and there are some simple but classic gags involving them that got big laughs out of my audience. This film's currency is belief, and director Peter Ramsey knows that belief is one of the most powerful things humans can experience. The movie plays with that concept in a number of ways, linking the very existence of the Guardians to the number of children that believe in them, as well as capitalizing on some very emotional moments for Jack (punctuated by Alexandre Desplat's beautiful score) that just might be enough to convince kids who may be considering abandoning their own belief in these icons to instead follow Journey's advice. The filmmakers made an interesting decision to avoid highlighting adults in the movie, giving the children that the Guardians interact with some moments to really shine. After all, Rise of the Guardians is primarily a movie for kids, and while those characters aren't front and center for the whole run time, they play an integral role during the climax and have the kind of agency that I'd hope the characters would have if I were that age again. 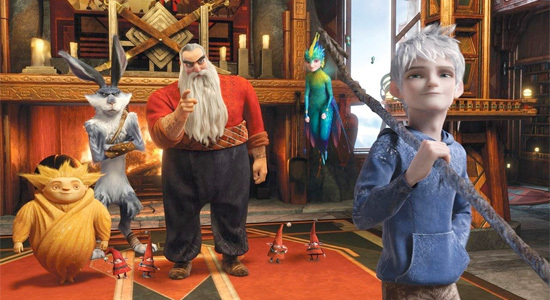 The trailer makes Rise of the Guardians out to be another run-of-the-mill action extravaganza, but it surprisingly works better in its quiet, emotional moments than it does in its frenetic setpieces. The animation is beautiful, each Guardian's world is richly designed and filled with loads of detail, and in a society in which the topics of belief and fear are often discussed behind closed doors and attributed to religious extremists or alarmist media, it's nice to see them explored so thoroughly in a mainstream animated film. This is director Peter Ramsey's feature directorial debut, and now that the Guardians have risen at the 2012 AFI Fest, here's hoping Ramsey continues to bring us more adventures with these characters in the coming years. No thanks. I'd rather take my kids to see Wreck It Ralph. This is a Redbox at best. I'm impressed you can tell the quality of a movie without even seeing it. we'll be there opening night!....oh, liked the journey reference.